A couple of weeks ago, the folks at Yellowstone National Park released another report, presumably sent to print before the shutdown, about the changes in the park’s ecosystem since the reintroduction of the grey wolf back in 1995. 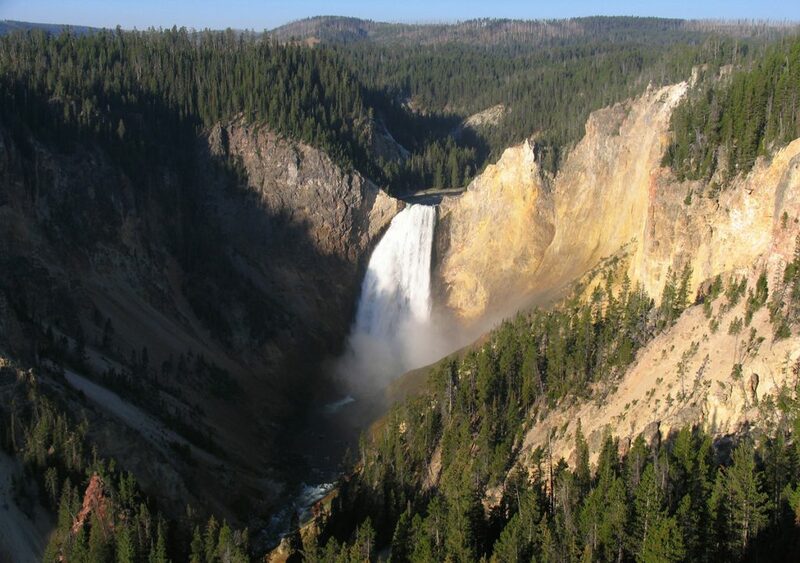 Back in the 1930’s, the wolf population was killed off in Yellowstone, and this led to a cascading effect of change in the terrain and in the rivers and in the wildlife populations at this magnificent national park. At first blush, you would think that the removal of one species would have a minimal effect, but you would be wrong about that. While bears and coyotes still hunted the elk that graze throughout the park, the deer and elk populations exploded. This led to overgrazing on grasses and on the tender willow trees that line the waters, on young stands of cottonwood and aspen. All of this caused a loss of bird and beaver habitat, soil erosion that led to increased flooding that changed the course of rivers and streams, which then had an impact on fish and the bears and other wildlife that feed on them. The entire ecosystem of Yellowstone is interconnected, so that one change leads to myriad others. In the 24 years since the grey wolf was re-introduced, their very presence has caused elk populations to be more mobile, so stands of trees are flourishing – quadrupling in height in one six-year period. Bird populations have returned. Deer are no longer overgrazing, so small rodents have repopulated, inviting a growing population of birds-of-prey that feed on them. And the renewed growth of willow trees by the water has stabilized the waterways and has been very good for the beavers whose dams create further water stability and shelter for fish. Even scavengers have benefited as they are able to feed on deer and elk killed by wolves rather than relying on harsh winters to kill off deer population, leaving carcasses on which to feed. When the Apostle Paul wrote about the members of the body, it is sort of an ecosystem to which he refers. All parts play an important role. In Yellowstone, a field mouse and a deer have a role to play. In the body of Christ, the shelter volunteer has a role just as the teacher does; the preacher as well as the choir member. The church in Corinth had descended into factionalism and one-upsmanship. The rich and self-important took the best seats, ate the best food, and didn’t leave anything for those they considered less important than themselves, and Paul is taking them to task for it. “You may think your foot is less important than your mouth, but try getting around without that foot.” Who you are and what you have is simply unimportant in God’s economy. Every person has value. Blessed are the meek, as someone else said. When Jesus strode into the synagogue in Nazareth, it was like a scene out of a movie. He had been recently baptized in the Jordan by John and had gained something of a reputation as he began preaching and teaching out and about in Galilee. And on the day he arrived in his hometown, you know the place was abuzz with anticipation. The synagogue was surely packed. Jesus takes the scroll and finds the appointed reading and, when he’s finished, rolls it up and hands it back to the hazzan,the one responsible for the services, and then slowly walks over to the Moses seat where the preacher sat, and calmly tells the gathering, “Today this scripture has been fulfilled in your hearing” (Luke 4:21). You could have heard a pin drop. Jesus has just told them that you poor and you captive and you blind and you oppressed – it’s all over and you are free. In that space, a bench lined the perimeter of the room and all the rich and powerful sat there while the nobodies say on the floor, and Jesus is looking atall of them and calling them poor and oppressed, trapped by the circumstances of their lives, but that jig is up. You’re all free. And they wanted to kill him for it. Their little ecosystem was balanced just the way they wanted it and how dare he reintroduce God’s justice and mercy into the mix? The Isaiah scroll from which he reads is the portion we would call Isaiah 61. It was written sometime after the Babylonian exile when those who returned were in conflict with those who had stayed. They were divided over religious observance and the temple that needed rebuilding, and Isaiah is proclaiming to them that God is about to right all the wrongs, to “build up the ancient ruins” and “repair the ruined cities” (Isaiah 61:4). In Jesus’s time, the people were not in exile but they were under the oppressive occupation of Rome, and it was a tempting thing for those with privilege to try to curry favor with the Roman authorities, to get what they could at the expense of everyone else. It was an ecosystem out of balance. Jesus is announcing and end to all of that. His inaugural address in his home town tells the world what he is about. And it isn’t about currying favor or spending time with the powerful. It’s about lifting up the lowly. It’s about restoring people to right relationship with God and each other. It’s about resetting the ecosystem so that everyone can flourish. Just like with Yellowstone, if the balance is out of whack, everyone suffers. “If one member suffers, all suffer together with it; if one member is honored, all rejoice together with it” (1 Corinthians 12:26), as Paul wrote. Even the so-called privileged and powerful were in a state of spiritual death, disconnected from God in ways they did not even comprehend. And Jesus is speaking to them, too. Their blindness was going to be healed. And they drove him out of town because sometimes it’s easier to live in the chaos and dysfunction we know rather than risk the unfamiliar world that we don’t know. It takes courage to give up our crutches, our excuses, our convenience. But the risk comes with great reward, because then the world is better for everyone. There is no part that is not needed or necessary, because we recognize that we need each other. We need the less-lovely parts of ourselves just as much as the beautiful parts in order to do God’s work in the world. Those of you who have spent any time in any church know that there are always those folk among us who toil at unseen tasks to serve others, to beautify our spaces, to make sure that details are attended to that nobody will notice but are important to our worship and common life. I knew an older woman in Charlottesville who felt that she didn’t have much she could give, but every couple of weeks, she went through every pew in the church to make sure that pens and pencils and paper that we kept there were sharp and clean and usable. And on August 12, 2017, two African American women pastors with mobility issues could not be out in the streets but situated themselves in a pew at the First Methodist Church and spent the day in prayer. None of these women were in the so-called important positions, but their ministries to us and for us were vital and needed. Their part of the body was, and is, irreplaceable. When God calls us into the body of Christ, God calls all of us, not just the good and beautiful and attention-grabbing parts. So let your chains be broken, let your sight be restored, come out from under whatever burden you bear, because God needs you. Every part of you. So that all of us, together, can enjoy the time of God’s favor. We need you. God needs you. It takes all of us to proclaim God’s reign on earth is in heaven.